With Thanksgiving around the corner, it’s an idyllic time to visit Central Park with friends and family. Did you know the Park has offered fun destinations and activities for families for more than 100 years? Not long after construction of Central Park began in 1858, New York City newspapers criticized the original design for its lack of facilities for children (especially underprivileged children) and their caregivers. 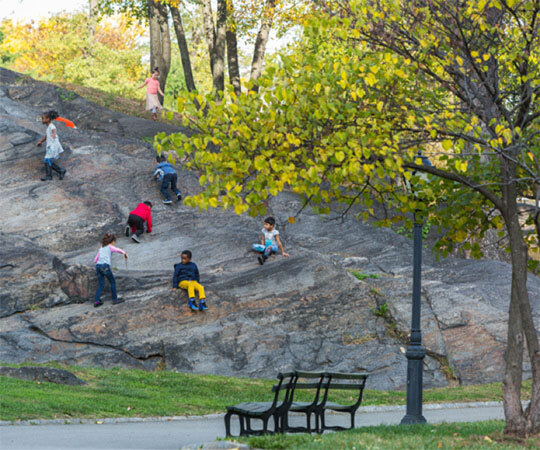 In response, the Park’s designers, Frederick Law Olmsted and Calvert Vaux, created the Children’s District in the lower end of the Park — easily accessible from streetcars at 59th Street. 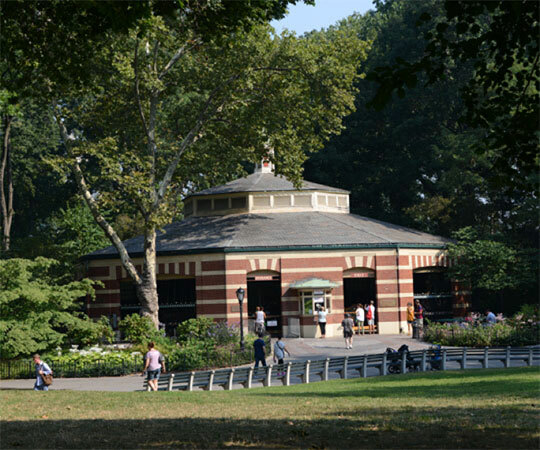 The Children’s District (mid-Park at 65th Street) featured Playmates Arch, the Dairy, a playground (now Heckscher Playground and Ballfields), the Kinderberg (now the Chess & Checkers House), the children’s cottage (since demolished), and the Carousel. Four of these attractions — the Dairy, the Kinderberg, the playground, and the Carousel — have greatly evolved since the first days of the Children’s District. Here’s a look at how they’ve transformed and what you’ll find in their place today. At the heart of the Children’s District was the Dairy, a charming Victorian cottage designed by Vaux and built between 1869 and 1871. Children and their caregivers could buy fresh milk and snacks and borrow games from the Dairy. Families enjoyed refreshments under the Dairy’s loggia (open-air porch) and enjoyed the cooling breezes coming from the nearby pond. By the 1950s, the building had become dilapidated. NYC Parks tore down the loggia and turned the building into a maintenance shed. In 1979, the Dairy was turned into the Park's first visitor center. A year later, the Conservancy recreated the original loggia from historic photographs. Today, the Dairy Visitor Center & Gift Shop offers maps, guides, and gifts, and serves as a starting point for many Park tours. Discovery Kits and Discovery Journals are also available at the Dairy. The Kinderberg (Dutch for “children’s mountain”) was built in 1866 and was the largest rustic structure in the Park. It served as a summerhouse — in other words, a rustic wooden structure in a garden or park built for enjoying summer breezes (the nearby Dene summerhouse and Cop Cot are two summerhouses you can still visit). 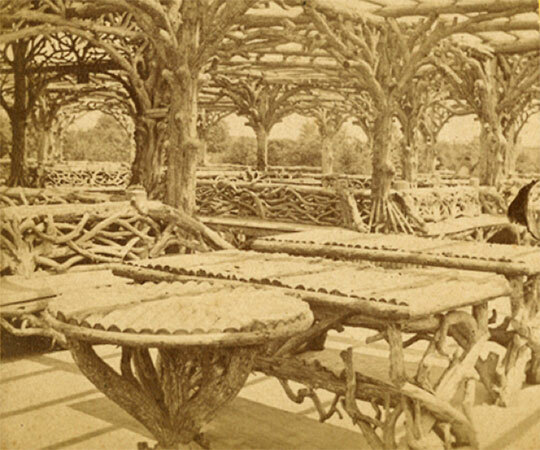 The Kinderberg featured rustic chairs and tables for children and their caregivers. Suffering from neglect and disrepair, the Kinderberg didn’t last beyond the 1940s. In 1952, private funds enabled construction of the Chess & Checkers House in its place, offering permanent chess tables outside. In 1986, the Conservancy refurbished the building and built the rustic pergola surrounding the house to provide shade. Today, it serves as another of the Park’s visitor centers. Chess and checkers players are also welcome to borrow pieces from Conservancy staff, or bring their own. Dominos, backgammon, and other board games — in addition to Discovery Kits and Discovery Journals — are also available. At the Ball Ground (also called the Play Ground), boys played sports such as baseball and cricket. Use of the Ball Ground was limited to children and highly regulated to prevent overcrowding, as well as to preserve the lawn. The nearby Ballplayers’ House, a changing room for players, was designed by Vaux. This area changed greatly in the 1920s. Heckscher Playground, located on part of the original Ball Ground, opened in 1926 and was the Park’s first equipment-filled playground. Today, this 1.8-acre playground features a shaded area with swings and slides; a large, maze-like climber and water feature; and more. The remaining area of the original Ball Ground continued to serve as ballfields. 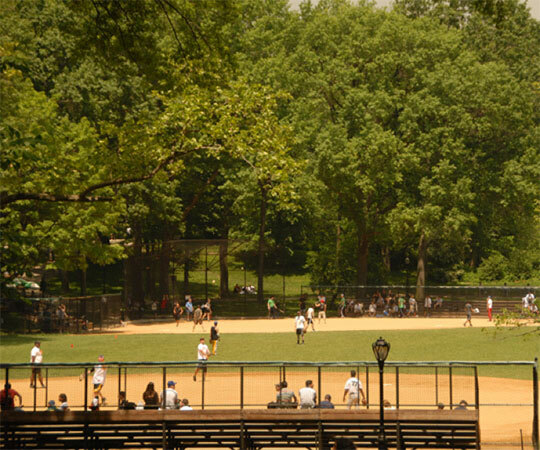 Hundreds of baseball and softball games are now played at the six fields at Heckscher Ballfields each season. The original Ballplayers’ House was demolished in the 1960s and replaced in 1991 by a refreshment stand that evokes the charm of the old building. Now the Ballfields Cafe, this eatery offers salads, sandwiches, burgers, and other ballpark snacks, with a view of Heckscher Ballfields. The first Carousel in the Park was powered by a hand crank; a few years later, the Carousel’s manpower was replaced by horsepower — a real horse hitched to a pole in the lower level of the structure. Children would lie on the ground to sneak a peek of the horse. These animals were taught to start and stop when the operator tapped on the floor. Soon after, the Carousel began using electricity. The next two Carousels were destroyed by fire, the first in 1924 and its successor in 1950. Searching for a replacement, NYC Parks discovered the current vintage carousel abandoned in an old trolley terminal on Coney Island. Today, the famed Carousel, with its sweet calliope music and 57 magnificent horses, remains one of the Park’s most popular attractions. However you spend your time in the Park this season, now you know the story behind the Children’s District, a distinct and historical area of the Park. Looking for more to do in the Park this Thanksgiving? 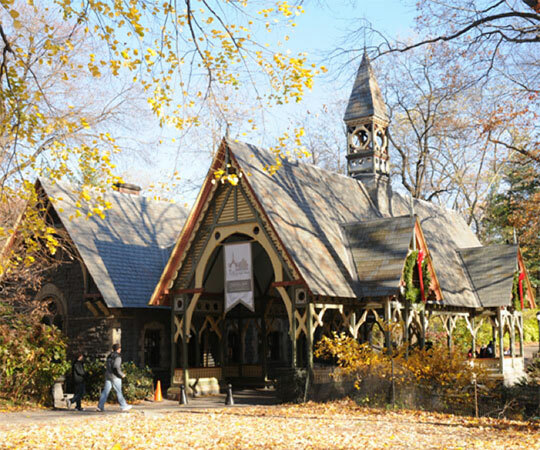 We have a few recommendations — from taking a Discovery Walk, to discovering the Park’s many playgrounds, to ice skating at Wollman Rink or Lasker Rink. There’s no shortage of things for kids to do in the Park.